Thank you to everyone who attended our 'Back to Back' Paint Off this past Saturday! We were happy to see everyone after a long week and glad you came out to support local artists from the Boston Figurative Art Center -- Damon Lehrer, Jon Nix, & Jeremy Durling. Each artist has his own unique style -- which made for a great demo. Damon and Jeremy painted in oil, but in two very different ways. Jeremy paints on paper and uses a trowel/palette knife most of the time while Damon paints on linen and uses brushes. As you can see in the images above, both artists produced two distinct pieces, even though they were painting the same model. To throw in another element, Jon worked in pencil to produce a beautiful drawing of our model Dennis. For those who were unable to attend we've compiled a list of some of the most commonly asked questions to each artist. Q -- Do you use your eraser as a tool in drawing? Jon Nix -- I usually use a kneaded eraser but didn't have one so I was using a mechanical eraser. It made for a delicate instrument but it worked well. Q -- Why did you choose to do a drawing instead of a painting? Jon Nix -- The reason I chose to draw rather then paint was that in a single session, my painting method results in a much less complete result. I thought it would be more instructional and rewarding for the viewers to see a work come closer to fruition than for them to see the faint contours and bulky masses I typically produce in a single sitting. Q -- What colors are on your palette and why? Damon -- ypically the smallest number of colors I can get away with. Today it's whites, two reds, two blues, and two yellows. Q -- What is the base color you started with on your canvas? Q -- How do you choose the colors on your palette? Jeremy -- My palette right now consists of all primary colors. I have three yellows, one red, three blues, and lead white. This is a slightly modified version of the palette Cezanne used in his painting 'The House of the Hanged Man' in 1873. I saw a Cezanne of peaches on a plate in the Barnes Foundation. It's a simple painting, but the color had my heart pounding and I could feel the weight of the fruit in the pit of my stomach. I wrote down the year it was painted and found out what colors he was using. I've been fond of limited palettes for the past few years, and I'm never afraid to choose a strange color I love and build a palette around it. I love the Cezanne palette for its versatility. Fighting the temptation to make everything bright and high key when I'm mixing these powerful primaries makes for some beautiful neutral colors that I wouldn't arrive at if I were using earth tones. I have to really meditate on each color to give my subject it's weight. Q -- What is the story behind your blue base drawing? Jeremy -- It is really just a series of lines with no clear subject. I use it as a way of measuring angles and proportions -- a blueprint for the person sitting in front of me. The simple drawing is easily and quickly adjusted until I find the truth of the thing. George Nick once told me: "Drawing is really very simple. It's only how far by how wide, at what angle." 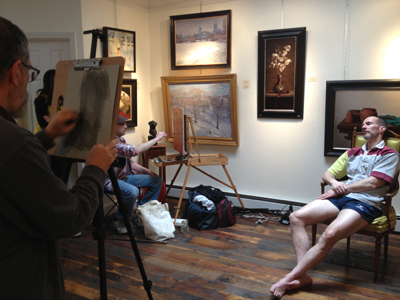 Thank you to our talented painters -- Damon, Jeremy, & Jon -- and our patient model Dennis. Look for us to do another Paint Off later in the year.